cranksets, as we should now apparently refer to the bits between one pedal and the other, are the very parts of a bike that tend to be ignored by all of us, rightly or wrongly. provided they work as designed, there is little or no reason to incorporate them in that overall sense of wellbeing engendered while riding a new bicycle. even when the crankset has been changed or upgraded, this particular set of components rarely invokes a major reaction: on a scale of one to ten, i doubt any crankset has been given a one or a ten. in this case, it was a malady affecting the crankset on a test bike that necessitated a change, replacement swiftly and efficiently supplied by the uk importer. in the case of the team issue, it arrived minus the q/r bolt (lost somewhere between the previous incumbent, and thewashingmachinepost) and constantly felt as if the crank was loose, despite tightening the bolt well past its bedtime. windwave sent me up a new bolt and q/r nut, but the problem persisted. i tried different pedals, cleats, wheels, and still the loose crank feeling would not go away. on closer examination, it appeared that the crank splines were not mating properly with the corresponding axle splines, so irrespective of the force applied to the tightening bolt, there was still a touch of radial movement. whether this was as a result of mechanical damage, or a problem at manufacture, i am ill equipped to tell, but windwave elected to replace the crankset with the sl-k carbon compact pro, the very model now fitted as standard on the bike under test (patience, dear reader, patience). 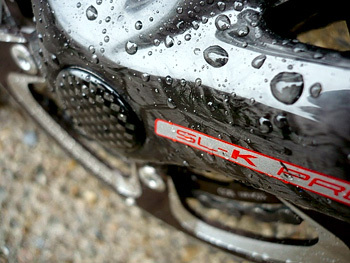 the sl-k pro compact differs from the team issue version most obviously in the profile of the splines connecting crank to axle: the team issue could reasonably be compared with the similarly profiled splines on a shimano freehub, while those on the sl-k are dramatically star shaped and of similar depth to those on a campagnolo freehub. this latter feature gives the crank one heck of a lot more purchase on the axle, and likely to give better transfer of power (it certainly feels like it, but this could be auto-suggestion). it's the incorporation of the axle on the drive side crank, necessitating use of a set of external bearings, that morphs a chainset into a crankset, though we're really dealing with semantics here. 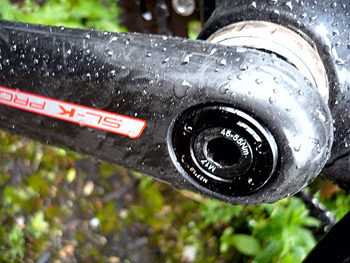 the mega-exo bottom bracket, sounding like a character from the new transformers movie, fitted very easily into the english threaded shell on the bicycle, placing a plastic sleeve between right and left cups, presumably in an attempt to keep crud away from those oversize bearings. a wavy washer needs to be fitted between the left crank and the external bearing seal (strangely missing from the original) before the crank is tightened onto the axle. this latter operation required a very long 8mm allen key to give sufficient leverage to tighten the bolt; the fact that this much effort was required provided confidence that the crank would stay in place. i have not tempted fate by attempting removal, but suffice to say all the torque i can produce has been pushed through this crankset over the last three days and the only movement has been forward. like campagnolo's cranks in which the carbon resembles a marble floor, fsa have opted for the same rather than a carbon weave, to my mind and aesthetic, far the better choice. not having to clamp the crank to the axle allows fsa to keep a more slimline, rounded profile on the crank, making it a less clunky option to either of the other two. sadly, fsa have persisted with the inexplicable neccesity to place a thin washer between pedal axle and crank arm. this may be a fit and forget operation for the one time owner of the bicycle, but this problem reared its head on the chris king cielo in portland: if, like me, part of the weekly process involves swapping pedals from bike to bike, the probability of losing at least one of these is greatly magnified. 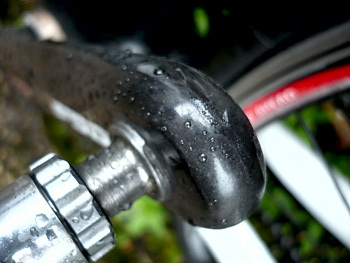 why, oh why can these not be incorporated into the crank arm as a permanent fixture, making life easier for all of us? chainrings are the seeming industry standard 50/34: i never was much good with numbers, and here is no exception. there's a 16 tooth gap between those two rings, while that of a standard 53/39 is only 14.
a compact chainset undoubtedly makes better use of the outer ring in regular flatland pedalling, but this larger tooth gap on the rings, meant that i was forever having to slip back up one sprocket after switching to the big ring and the opposite when flipping back to the inner. i realise that fsa are not alone in this area, but i can't help feeling that a 50/36 combination would work a lot better. the mighty dave t feels that he may concur with me on this point. that aside, the crankset reverted to type as elucidated at the top of the article: once it was on the bike, i almost forgot about it. just as it should be. retail cost is £270, roughly comparable with campagnolo's chorus crankset and about midway between shimano's ultegra and dura-ace (though the latter two are not available in carbon fibre). easy to fit, very efficient in operation, and most importantly, very stylish.